A medium sized saucer shaped headpiece with a moulded crown, created in Royal Blue Wool Felt. An array of toning hand cut and curled feathers on both the top and the underside. 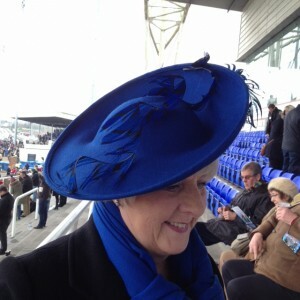 Gorgeous & Glorious Royal Blue Wool Felt Medium Size Saucer Headpiece. In vibrant Royal Blue Wool Felt with hand cut and curled feathers. The price quoted is for the HIRE of this piece - please refer to our Terms & Conditions of Hire. Also available to hire in Black Wool Felt.